With 57 years of label printing expertise, South African Rebsons Labels, a family-owned business, moves into digital label printing with their investment in the Nilpeter PANORAMA. In 1963, Rebsons Labels purchased their first printing press and started to produce labels – thus becoming a self-adhesive label manufacturing company. Rebsons Labels has moved with the technological trends over the past years, upgrading and purchasing state-of-the-art label printing equipment”, says Rebsons’ owner Benny Friedman. 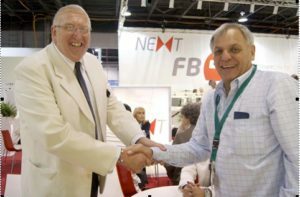 In 1972, Benny Friedman attended his first Drupa exhibition. His intention was to buy a flexo press of the same brand as those already in his production. But when Mr. Friedman came to the Nilpeter booth and saw the S-185 4-colour flexo press, his eyes started to sparkle. He admitted to then Nilpeter agent in South Africa that this was his dream machine. Unfortunately, it was out of his price range. Luckily the Nilpeter agent had good contacts in the South African banking industry, so he pulled a few strings and managed to arrange funding. This meant the beginning of a 40-year business relationship. “My first Nilpeter press changed my business. Suddenly I was able to print the highest quality. I printed self-adhesive labels that were far more sophisticated, launching my business into a whole different league”, Friedman explains. “All the presses I have bought over the years have been state-of-the-art, and I have retained my advantage”, he concludes. Over the years, Rebsons has bought many Nilpeter presses. In the 80s, before the era of trade sanctions, the first B-200 was acquired. As Danish suppliers to South Africa were part of the sanctions, the trading stopped, but in 1992 with the sanctions being removed, Rebsons bought a second B-200 and a third B-200 followed shortly thereafter. Nilpeter FA-2500, FB-2500, and FB-3300s have all been part of the growth at Rebsons. And now the next step has been taken with the addition of the PANORAMA.